This magnetic health-care waistbelt is a new type of waist-protecting health-care apparatus which is designed according to human physiological characteristics and applies biomechanics theory combined with magnetic therapy principle. It has small size, appropriate thickness, reasonable structure, durable performance and is convenient for use and carrying. Its degree of tightness can be adjusted willfully. It can be used anywhere and anytime.lt is necessaries of family and traveling. It's good not only for healthy people to keep normal physiological curve of lumbar vertebra and prevent strain of lumbar muscles but also for patients suffered with illness of lumbar vertebra to recover its normal physiological curve. When the waistbelt is put around the waist, its stiff material can support the upper part of the body to relieve the pressure on the waist and keep normal physiological curve of lumbar vertebra. 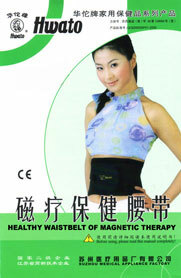 It can relieve waist illness and pain as well as has magnetic therapeutic effect. Magnetic therapy can activate the enzyme of human body and strengthen the human immunity. When the blood is magnetized, the ferrous and oxygen content will be raised obviously, the electric charge of erythrocyte will increase, blood vessels will be expanded, blood flow will be quickened, mucosity and ESR will decrease, When the acupoints on human waist are magnetized, it has the effect of pain-easing, inflammation-reducing, ect. It can return the unbalanced magnetic area resulted from illness to normal. When magnetic force line penetrates human tissue, collaterals and channels can be dredged, vital energy and blood can be activated, inflammation and pain can be reduced. It 's helpful to prevent and relieve all kinds of waist illness, including protrusion of the lumbar interverbral disc, strain of lumbar muscles, bone hyperplasia of lumbar vertebra, acute waist strain, waist transverse process syndrome, lumbosacral joint injury. It can also apply to backward protrusion or side-bending of lumbar vertebra and lumbar constrictive fracture. When lying, put the waistbelt cushion behind the waist and buckle the waistbelt to a comfortable extent. When standing, straighten the waist as much as possible, then put the waistbelt cushion behind the waist and buckle the waistbelt to a comfortable extent. The product is made of inflammable material,so please keep it away from fire and high-temperature environment. Keep it away from magnetism-avoiding articles such as TV set,magnetic card, computer and so on. Cleaning: the temperature of water should be below 50'C (122'F), don't rub. The patient lying long in bed should clean the affected part regularly and keep it clean. Bleeding tendency(such as decreasing of blood platelet, leukaemia). It should be stored in dry, non-corrosive and ventilated environment of appropriate temperature.